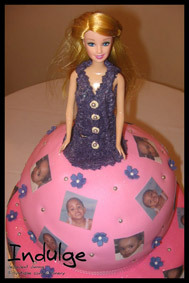 Below is just a few examples of the Kid's cakes that we have in our portfolio. 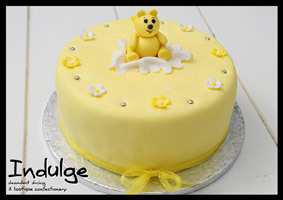 Baby Bear Cake - Sponge cake with sugar paste icing or butter icing and decorated with edible sugar paste figurines. 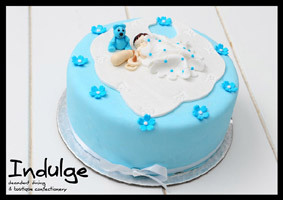 Baby Boy Cake - Sponge cake with sugar paste icing or butter icing and decorated with edible sugar paste figurines. 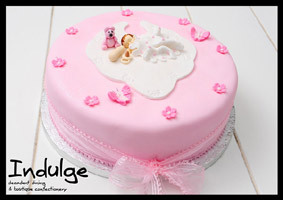 Baby Girl Cake - Sponge cake with sugar paste icing or butter icing and decorated with edible sugar paste figurines. 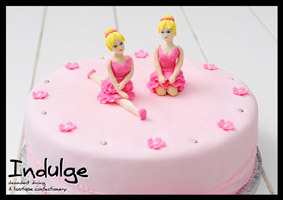 Ballerina Cake - Sponge cake with sugar paste icing or butter icing and decorated with edible sugar paste figurines. 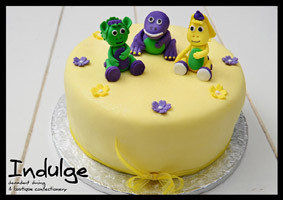 Barney and Friends Cake - Sponge cake with sugar paste icing or butter icing and decorated with edible sugar paste figurines. 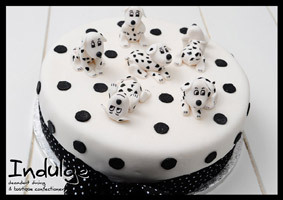 Dalmations Cake - Sponge cake with sugar paste icing or butter icing and decorated with edible sugar paste figurines. 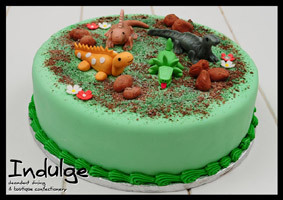 Dinosaurs Cake - Sponge cake with sugar paste icing or butter icing and decorated with edible sugar paste figurines. 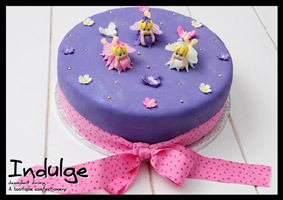 Fairy Cake - Sponge cake with sugar paste icing or butter icing and decorated with edible sugar paste figurines. 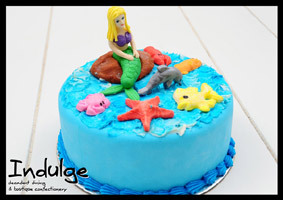 Mermaid Cake - Sponge cake with sugar paste icing or butter icing and decorated with edible sugar paste figurines. 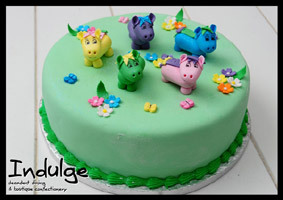 My Little Pony Cake - Sponge cake with sugar paste icing or butter icing and decorated with edible sugar paste figurines. 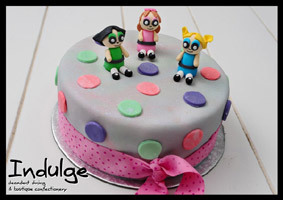 Power Puff Girls Cake - Sponge cake with sugar paste icing or butter icing and decorated with edible sugar paste figurines. 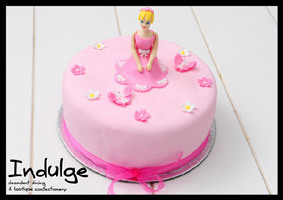 Princess Cake - Sponge cake with sugar paste icing or butter icing and decorated with edible sugar paste figurines. 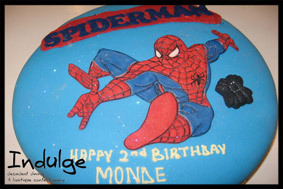 Spiderman Cake - Sponge cake with sugar paste icing or butter icing and decorated with edible sugar paste figurines. 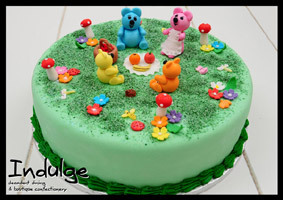 Teddy Bears Picnic Cake - Sponge cake with sugar paste icing or butter icing and decorated with edible sugar paste figurines. 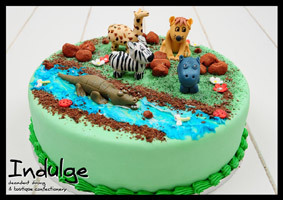 Wild Animals Cake - Sponge cake with sugar paste icing or butter icing and decorated with edible sugar paste figurines. 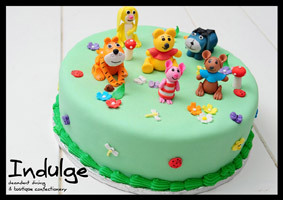 Winnie the Pooh and Friends Cake - Sponge cake with sugar paste icing or butter icing and decorated with edible sugar paste figurines. 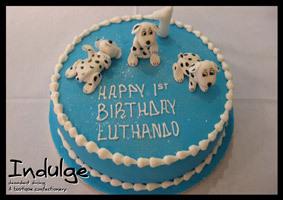 Boys Dalmations Cake - Sponge cake with sugar paste icing or butter icing and decorated with edible sugar paste figurines. 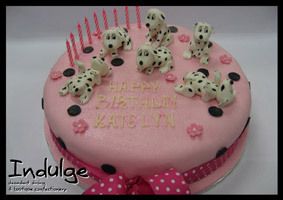 Girls Dalmations Cake - Sponge cake with sugar paste icing or butter icing and decorated with edible sugar paste figurines. 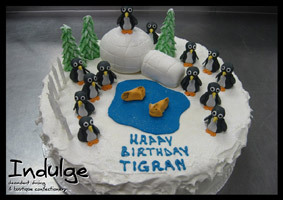 Penguin Cake - Decorated with sugar paste icing, royal icing details, edible sugar paste figurines and edible glitter. 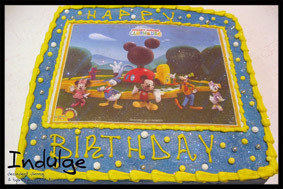 Mickey Mouse Edible Image Cake – Cake with butter icing and decorated with a edible image scan, silver balls and glitter. 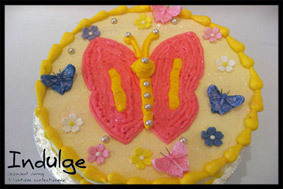 Butterfly Round Cake – Cake with Butter Icing and Edible Sugar Paste Decorations. 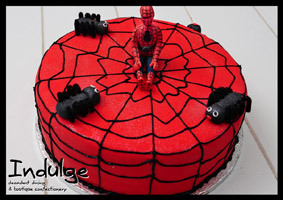 Spiderman Disc Cake – Cake with sugar paste icing and decorated with a sugar paste spiderman disc. 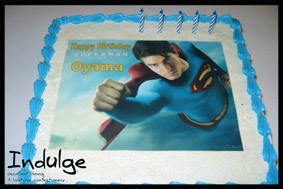 Superman Edible Image Cake – Cake with Butter Icing and Decorated with Edible Image Scan and edible decorations. 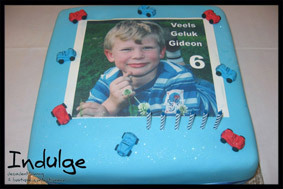 Edible Image Scan – Cake with Sugar Paste Icing and Decorated with Edible Image Scan and Edible Sugar Paste Cars. 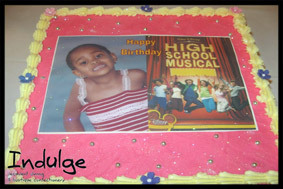 Edible Image Scan Cake – Cake with Butter Icing with Edible Decorations and Edible Image Scans. 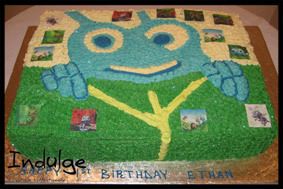 Bugs Life Cake – Cake with Butter Icing and Decorated with Butter Icing Picture of Bugs life and Edible Image Scans of Characters from Bugs Life. 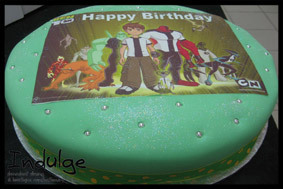 Ben 10 Edible Image Cake – Cake with sugar paste icing and decorated with a edible image scan, coloured metallic balls and glitter. 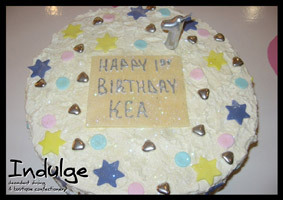 1st Birthday Cake - Decorated with sugar paste icing, edible sugar paste details and edible glitter. 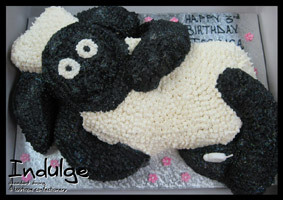 Shaun the Sheep - Vanilla or Chocolate sponge cake with butter icing. 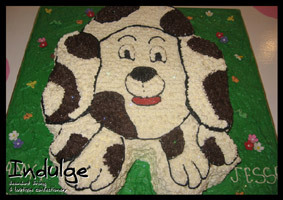 Patches the Dog - Cake iced with butter icing, royal icing details and edible sugar paste flowers and bugs. 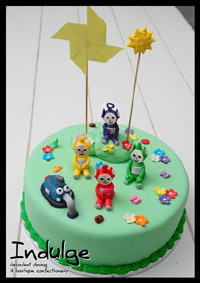 Teletubbies Cake - Sponge cake with sugar paste icing or butter icing and decorated with edible sugar paste figurines. 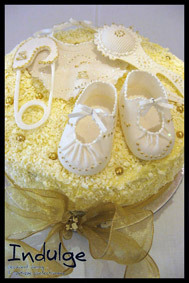 Baby Christening Cake – Cake with Butter Frosting Icing and White Chocolate with Edible Sugar Paste Figurines. 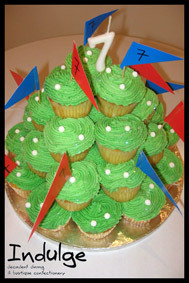 Golf Cupcake Tower – Cupcakes with Butter Icing and Decorated with Mini Sugar Golf Balls and Non Edible Flags. 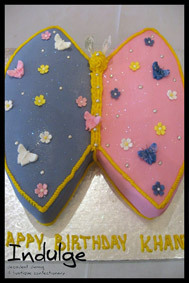 2D Butterfly Cake – Cake with Sugar Paste Icing and Edible Sugar Paste Decorations. 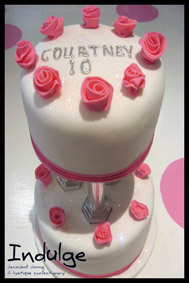 Mini Kids Tiered Cake – Cake with sugar paste icing and decorated with silver tiers, edible sugar paste roses and ribbon. 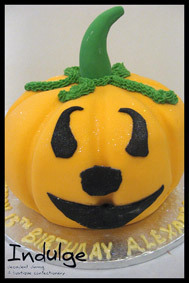 Halloween Pumpkin Cake – Cake with Sugar Paste Icing and Royal Icing Details. 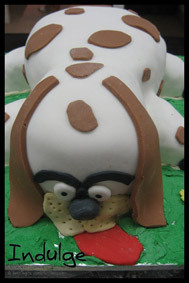 Patches the Dog Cake – Cake with Sugar Paste Icing and Decorated with Sugar Paste and Royal Icing Details. 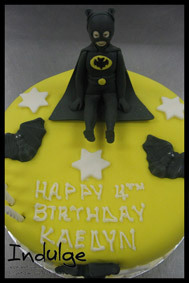 Batman Cake – Cake with Sugar Paste Icing and Decorated with Sugar Paste Edible Figurines . 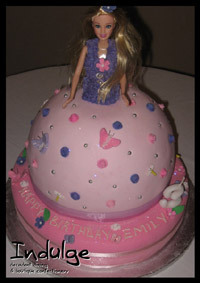 Barbie Doll Cake - Cake shaped as a barbie doll dress and decorated with sugar paste icing, royal icing details and sugar paste edible flowers and butterflies.